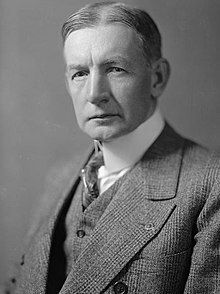 Charles Gates Dawes (August 27, 1865 – April 23, 1951) was an American banker, general, diplomat, and Republican politician who was the 30th vice president of the United States from 1925 to 1929. For his work on the Dawes Plan for World War I reparations, he was a co-recipient of the Nobel Peace Prize in 1925. Born in Marietta, Ohio, Dawes attended Cincinnati Law School before beginning a legal career in Lincoln, Nebraska. After serving as a gas plant executive, he managed William McKinley's 1896 presidential campaign in Illinois. After the election, McKinley appointed Dawes as the Comptroller of the Currency, and he remained in that position until 1901 before forming the Central Trust Company of Illinois. Dawes served as a general during World War I, holding the position of chairman of the general purchasing board for the American Expeditionary Forces. In 1921, President Warren G. Harding appointed Dawes as the first Director of the Bureau of the Budget. Dawes also served on the Allied Reparations Commission, where he helped formulate the Dawes Plan to aid the struggling German economy, though the plan was eventually replaced by the Young Plan. The 1924 Republican National Convention nominated President Calvin Coolidge without opposition. After Frank Lowden declined the vice presidential nomination, the convention chose Dawes as Coolidge's running mate. The Republican ticket won the 1924 presidential election and Dawes was sworn in as vice president in 1925. Dawes helped pass the McNary–Haugen Farm Relief Bill in Congress, but the bill was vetoed by President Coolidge. Dawes was a candidate for re-nomination at the 1928 Republican National Convention, but Coolidge's opposition to Dawes helped ensure that Charles Curtis was nominated for the vice presidency instead. In 1929, President Herbert Hoover appointed Dawes to be the Ambassador to the United Kingdom. Dawes also briefly led the Reconstruction Finance Corporation, which organized a government response to the Great Depression. He resigned from that position in 1932 to return to banking, and he died in 1951 of coronary thrombosis. From 1909 to 1951, Charles G. Dawes lived in this house at 225 Greenwood St. in Evanston, Illinois, which was built in 1894 by Robert Sheppard. The house is a National Historic Landmark. Dawes was born in Marietta, Ohio, in Washington County, son of Civil War General Rufus Dawes and his wife Mary Beman Gates. Rufus Dawes had commanded the 6th Wisconsin Regiment of the Iron Brigade from 1863 to 1864 during the American Civil War. His Uncle Ephraim C. Dawes, younger brother to Rufus, was a Major who served under Ulysses S. Grant at the Battles of Shiloh and Vicksburg. Dawes's brothers were Rufus C. Dawes, Beman Gates Dawes, and Henry May Dawes, all prominent businessmen or politicians. He also had two sisters, Mary Frances Dawes Beach, and Betsey Gates Dawes Hoyt. Dawes married Caro Blymyer on January 24, 1889. They had a son, Rufus Fearing (1890–1912), and a daughter, Carolyn. They later adopted two children, Dana and Virginia. He graduated from Marietta College in 1884, and from the Cincinnati Law School in 1886. His fraternity was Delta Upsilon. Dawes was admitted to the bar in Nebraska, and he practiced in Lincoln, Nebraska, from 1887 to 1894. When Lieutenant John Pershing, the future Army general, was appointed as a military instructor at the University of Nebraska while attending its law school, he and Dawes met and formed a lifelong friendship. Dawes also met Democratic Congressman William Jennings Bryan, forming a friendship with Bryan despite his opposition to Bryan's free silver policies. Dawes relocated from Lincoln to Chicago during the Panic of 1893. In 1894, Dawes acquired interests in a number of Midwestern gas plants, and he became the president of both the La Crosse Gas Light Company in La Crosse, Wisconsin and the Northwestern Gas Light and Coke Company in Evanston, Illinois. Dawes was a self-taught pianist and a composer. His composition Melody in A Major became a well-known piano and violin song in 1912. Marie Edwards made a popular arrangement of the work in 1921. Also, in 1921, it was arranged for a small orchestra by Adolf G. Hoffmann. Melody in A Major was played at many official functions which Dawes attended. In 1951, Carl Sigman added lyrics to Melody in A Major transforming the song into "It's All in the Game". Tommy Edwards's recording of "It's All in the Game" was a number-one hit on the American Billboard record chart for six weeks in the fall of 1958. Edwards's version of the song also hit number one on the United Kingdom chart that year. Since then, it has since become a pop standard. It has been recorded by numerous artists, including Cliff Richard, The Four Tops, Isaac Hayes, Jackie DeShannon, Van Morrison, Nat "King" Cole, Brook Benton, Elton John, Mel Carter, Donny and Marie Osmond, Barry Manilow, and Keith Jarrett. Dawes was a brother of Phi Mu Alpha Sinfonia. Dawes's prominent positions in business caught the attention of Republican party leaders. They asked Dawes to manage the Illinois portion of William McKinley's bid for the Presidency of the United States in 1896. Following McKinley's election, Dawes was rewarded for his efforts by being named Comptroller of the Currency, United States Department of the Treasury. Serving in that position from 1898 to 1901, he collected more than $25 million from banks that had failed during the Panic of 1893, and also changed banking practices to try to prevent a similar event in the future. Upon the death of his father in 1899, Dawes became a First Class Companion of the Military Order of the Loyal Legion of the United States. In October 1901, Dawes left the Department of the Treasury in order to pursue a U.S. Senate seat from Illinois. He thought that, with the help of the McKinley Administration, he could win it. McKinley was assassinated and his successor, President Theodore Roosevelt, preferred Dawes's opponent. In 1902, following this unsuccessful attempt at legislative office, Dawes declared that he was done with politics. He organized the Central Trust Company of Illinois, where he served as its president until 1921. On September 5, 1912, Dawes's 21-year-old son Rufus drowned in Geneva Lake, while on summer break from Princeton University. In his memory, Dawes created homeless shelters in both Chicago and Boston. During the First World War, Dawes was commissioned major, lieutenant colonel, and colonel of the 17th Engineers. In October 1918 he was promoted to brigadier general. From August 1917 to August 1919, Dawes served in France during World War I as chairman of the general purchasing board for the American Expeditionary Forces (AEF), as a member representing the AEF on the Military Board of Allied Supply, and, after the war, as a member of the Liquidation Commission of the United States War Department. He was decorated with the Distinguished Service Medal and the French Croix de Guerre in recognition of his service. He returned to the United States on board the SS Leviathan in August 1919. In February 1921, the U.S. Senate held hearings on war expenditures. During heated testimony, Dawes burst out, "Hell and Maria, we weren't trying to keep a set of books over there, we were trying to win a war!" He was later known as "Hell and Maria Dawes" (although he always insisted the expression was "Helen Maria"). Dawes resigned from the Army in 1919 and became a member of the American Legion. He supported Frank Lowden at the 1920 Republican National Convention, but the presidential nomination went to Warren G. Harding. When the Bureau of the Budget was created, he was appointed in 1921 by President Harding as its first director. Secretary of Commerce Herbert Hoover appointed him to the Allied Reparations Commission in 1923. For his work on the commission's Dawes Plan, a program to enable Germany to restore and stabilize its economy, Dawes shared the Nobel Peace Prize in 1925. The Dawes Plan provided significant US funds, raised through bond sales, to the German economy, and permitted Germany to recover its industrial production while making reparation payments. In 1929 the Reparations Commission, under Owen Young, replaced the plan with the more permanent Young Plan, which reduced the total amount of reparations and called for the removal of occupying forces. I should hate to think that the Senate was as tired of me at the beginning of my service as I am of the Senate at the end. At the 1924 Republican National Convention, President Calvin Coolidge was quickly selected almost without opposition to be the Republican presidential nominee. The vice presidential nominee was more contested. Illinois Governor Frank Lowden was nominated, but declined. Coolidge's next choice was Idaho Senator William Borah, but he also declined the nomination. The Republican National Chairman, William Butler, pledged to nominate then Commerce Secretary Herbert Hoover, but he was not sufficiently popular. Eventually, the delegates chose Dawes to be the vice presidential nominee. Coolidge quickly accepted the delegates' choice and felt that Dawes would be loyal to him and make a strong addition to his campaign. Dawes traveled throughout the country during the campaign, giving speeches to bolster the Republican ticket. He frequently attacked Progressive nominee Robert M. La Follette Sr. as a dangerous radical who sympathized with the Bolsheviks. Dawes was elected Vice President of the United States on November 4, 1924 with more popular votes than the candidates from the Democratic and Progressive parties combined. The inauguration was held on March 4, 1925. On March 10, the president's nomination of Charles B. Warren to be United States Attorney General was being debated. In the wake of the Teapot Dome scandal and other scandals, Democrats and Progressive Republicans objected to the nomination because of Warren's close association with the Sugar Trust. At midday, six speakers were scheduled to address Warren's nomination. Desiring to take a break for a nap, Dawes consulted the majority and minority leaders, who assured him that no vote would be taken that afternoon. After Dawes left the Senate, however, all but one of the scheduled speakers decided against making formal remarks, and a vote was taken. When it became apparent that the vote would be tied, Republican leaders hastily called Dawes at the Willard Hotel and he immediately left. While waiting for Dawes to arrive, the only Democratic senator who had voted for Warren switched his vote. The nomination had failed by a single vote resulting in the first such rejection of a president's nominee in nearly 60 years. This incident was chronicled in a derisive poem, based on the Longfellow poem "Paul Revere's Ride;" it began with the line, "Come gather round children and hold your applause for the afternoon ride of Charlie Dawes." The choice of poem was based on Charles Dawes being descended from William Dawes, who rode with Paul Revere. Dawes and Coolidge quickly became alienated from one another. Dawes declined to attend Cabinet meetings and annoyed Coolidge with his attack on the Senate filibuster. Dawes championed the McNary–Haugen Farm Relief Bill, which sought to alleviate the 1920s farm crisis by having the government buy surplus farm produce and sell that surplus in foreign markets. Dawes helped ensure the passage of the bill through Congress, but it was vetoed by President Coolidge. In 1927, Coolidge announced that he would not seek re-election. Dawes again favored Frank Lowden at the 1928 Republican National Convention, but the convention chose Herbert Hoover. Rumors circulated about Dawes being chosen as Hoover's running mate. Coolidge made it known that he would consider an affront the renomination of Dawes as vice president, and Charles Curtis of Kansas, known for his skills in collaboration, was chosen as Hoover's running mate. After Dawes had finished his term as vice president, he served as the U.S. Ambassador to the United Kingdom (i.e., to the Court of St. James's) from 1929 to 1931. Overall, Dawes was considered to be a very effective U.S. ambassador, as George V's son, the future Edward VIII, would later confirm in his memoirs. Dawes was rather rough-hewn for some of his duties, disliking having to present American débutantes to the King. On his first visit to the royal court, in deference to American public opinion, he refused to wear the customary Court dress, which then included knee breeches. This episode was said to upset the King, who had been prevented by illness from attending the event. As the Great Depression continued to ravage the United States, Dawes accepted President Herbert Hoover's appeal to leave diplomatic office and head the newly created Reconstruction Finance Corporation (RFC). But after a few months, Dawes resigned from the RFC. As a board member of the failing City National Bank and Trust Company of Chicago, he felt obligated to work for its rescue. Political opponents alleged that, under Dawes's leadership, the RFC had given his bank preferential treatment. This marked the end of Dawes's career in public service. For the 1932 election, Hoover considered the possibility of adding Dawes to the ticket in place of Curtis, but Dawes declined the potential offer. Dawes resumed a role in the banking business, serving for nearly two decades as chairman of the board of the City National Bank and Trust Co., from 1932 until his death. He died on April 23, 1951 at his Evanston home from coronary thrombosis. He is interred in Rosehill Cemetery, Chicago. In 1925, Dawes was a co-winner of the Nobel Peace Prize for his work on World War I reparations. In 1944, he bequeathed his lakeshore home in Evanston to Northwestern University for the Evanston Historical Society (later renamed the Evanston History Center). Dawes lived in the house until his death. The Dawes family continued to occupy it until the death of Mrs. Dawes in 1957. Since then, the Evanston History Center operates out of the house and manages it as a museum. Designated a National Historic Landmark, the Charles G. Dawes House is listed on the National Register of Historic Places. Dawes, C. G. (1894). The Banking System of the United States and Its Relation to the Money and the Business of the Country. Chicago: Rand McNally. Dawes, C. G. (1915). Essays and Speeches. New York: Houghton. Dawes, C. G. (1921). Journal of the Great War. 2 vols. New York: Houghton. Dawes, C. G. (1923). The First Year of the Budget of the United States. New York: Harper. Dawes, C. G. (1935). Notes as Vice President, 1928–1929. Boston: Little, Brown. Dawes, C. G. (1937). How Long Prosperity? New York: Marquis. Dawes, C. G. (1939). Journal as Ambassador to Great Britain. New York: Macmillan. Dawes, C. G. (1939). A Journal of Reparations. New York: Macmillan. Dawes, C. G. (1950). A Journal of the McKinley Years. Bascom N. Timmons (Ed.). La Grange, IL: Tower. ^ Dunlap, Annette B. (2016). Charles Gates Dawes: a Life. Northwestern University Press and the Evanston History Center. p. 12. ISBN 9780810134195. ^ "The religion of Charles G. Dawes, U.S. Vice-President". www.adherents.com. Retrieved June 7, 2018. ^ a b c d e Davis, Jr., Henry Blaine (1998). Generals in Khaki. Raleigh, NC: Pentland Press, Inc. p. 103. ISBN 1571970886. ^ a b Dunlap, Annette B. Charles Gates Dawes: a Life. p. 17. ^ Dunlap, Annette B. Charles Gates Dawes: a Life. p. 18. ^ Dunlap, Annette B. Charles Gates Dawes: a Life. pp. 20–38. ^ Dunlap, Annette B. Charles Gates Dawes: a Life. pp. 24–25. ^ a b c d e f "Charles G. Dawes, 30th Vice President (1925–1929)". US Senate. Archived from the original on November 6, 2014. Retrieved February 2, 2017. ^ Joel Whitburn, The Billboard Book of Top 40 Hits, revised and enlarged 6th edition (New York: Billboard Publications, 1996), 201. ^ Whitburn, Joel (2004). Top R&B/Hip-Hop Singles: 1942–2004. Record Research. p. 539. ^ "The Vice President Who Wrote a Hit Song". August 16, 2011. ^ "Charles Gates Dawes Timeline – Evanston History Center". ^ "Let's Talk It Over". The National Magazine. 46 (September): 905. 1917. Retrieved January 26, 2017. ^ New York Times. October 4, 1918. ^ "Valor awards for Charles G. Dawes". ^ New York Times. August 7, 1919. ^ Dunlap, Annette B. Charles Dawes Gates: a Life. p. 144. ^ "Vice President Dawes". Forbes Library. Retrieved July 12, 2018. ^ Reviews, C.T.I (October 16, 2016). American Foreign Relations, A History. p. 193. ISBN 9781619066649. Retrieved January 26, 2017. ^ Mencken, Henry Louis; George Jean Nathan (1929). The American Mercury. p. 404. ^ Dunlap, Annette B. Charles Gates Dawes: a Life. pp. 221–44. ^ Witcover, Jules (2014). The American Vice Presidency. Smithsonian Books. p. 296. ^ "Dawes, Charles Gates – Biographical Information". Biographical Directory of the United States Congress. Archived from the original on September 15, 1999. Retrieved January 17, 2018. ^ "Charles G. Dawes, Ex-Vice President, Dies (April 24, 1951)". ^ Rumore, Kori. "Buried in Chicago: Where the famous rest in peace". ^ Dunlap, Annette B. Charles Gates Dawes: a Life. pp. 178–79. Dunlap, Annette B. (2016). Charles Gates Dawes: a Life. Northwestern University Press and the Evanston History Center. ISBN 9780810134195. Goedecken, Edward A. (1985). "A Banker at War: The World War I Experiences of Charles Gates Dawes". Illinois Historical Journal. 78 (3): 195–206. JSTOR 40191858. Goedecken, Edward (November 1987). "Charles G. Dawes Establishes the Bureau of the Budget, 1921-1922". The Historian. 50 (1): 40–53. JSTOR 24446946. Haberman, F. W. (Ed.). (1972). Nobel Lectures, Peace 1901–1925. Amsterdam: Elsevier Publishing. Hatfield, Mark O. (1997). "Vice Presidents of the United States Charles G. Dawes (1925–1929)" (PDF). U.S. Government Printing Office. Pixton, J. E. (1952). The Early Career of Charles G. Dawes. Chicago: University of Chicago Press. Sherman, Richard G. (1965). "Charles G Dawes, a Nebraska Businessman, 1887-1894: The Making of an Entrepreneur" (PDF). Nebraska History. 46: 193–207. Sortland, R. A. (1958). Charles G. Dawes: Businessman in Politics. Unpublished manuscript, University of Cincinnati, Cincinnati, OH. Timmons, B. N. (1953). Portrait of an American: Charles G. Dawes. New York: Holt. Waller, R. A. (1998). The Vice Presidents: A Biographical Dictionary. Purcell, L. E. (Ed.). New York: Facts On File. Wikimedia Commons has media related to Charles Gates Dawes. "Charles G. Dawes". Find a Grave. Retrieved May 14, 2009. This page was last edited on 24 April 2019, at 02:15 (UTC).